History: was created by aircraft broker The Aviation Factory and was presented to the press on January 23 2013. Purpose of this tailor-made boutique airline is: visualizing the invisible, give added value to an existing service and bringing back forgotten values and making aviation inspiring again. The product can be completely tailor made on the clients demand. 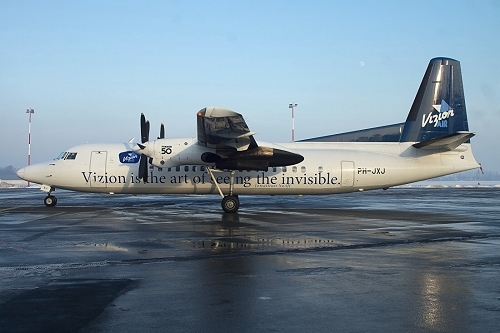 The leased Fokker 50 arrived at Antwerp on January 23 2013 but made afterwards a couple flights for third parties not related with Vizion Air activities. First flight on behalf Vizion Air took place on February 14 2013 with a BioFach flight Antwerp-Nürnberg-Antwerp. BioFach = world's largest trade fair for organic products which took place at Nürnberg in 2013. After this date several more specialized charters were conducted covering entire Europe. Not only their "own" Fokker is available for lease but also dozens of other aircraft can be made available via The Aviation Factory group ranging from 3 up to 400 passengers. The Fokker 50 was returned to Denim in November 2013, operations continue with other leased aircraft like from VLM.